The latest in the G-series, compared to its predecessor the Powershot G15 (reviewed here), the G16 has faster autofocus, new wireless capabilities and an improved image processor. Beyond that, it’s hard to tell the two apart. The 28–140mm lens, 12.1-megapixel sensor and three-inch LCD are unchanged and both cameras look the same too. Thanks to built-in WiFi — fast becoming a standard feature in cameras, and about time too — you can transfer pictures from the Powershot G16 without plugging in cables or removing the memory card. There is a free Canon CameraWindow app for iOS and Android devices that’ll let you move full-resolution photos to your phone or tablet, from where you can edit and upload them wherever you like. The G16 can also upload pictures directly to a PC or the Canon Image Gateway photo sharing site. Apart from the wireless connectivity, Canon have also updated the image processor to the new Digic 6. Apparently, this chip lets the camera shoot and process images at the same time, “eliminating buffering time” and making it possible to shoot continuously at 9.3 fps for up to 522 shots. The autofocus and shutter lag time are also about 40% quicker than on the Powershot G15. Why care about a new camera? Being a fixed-lens point-and-shoot, the camera will synchronise with flash at any shutter speed up to its maximum of 1/4000 second. We explored the implications of this in our recent Canon G15 vs. Fuji X20 review, so have a look at that article if you’re interested in using cameras like these with external flash. Equipped with a full-size standard hotshoe, the G16 is specified to work with Canon E-TTL Speedlites, but not with the ST-E3-RT or with the 600EX-RT in radio transmission mode. The built-in flash has E-TTL but not wireless master control. Despite the additional of WiFi, any form of wireless control to or from the camera is still missing. While the Powershot G16 can upload images over the air, you can’t use the iOS or Android app as a remote control. As a result this leaves Canon trailing behind the likes of Samsung and other brands in the connectivity stakes. You can still use radio triggers and wireless tethering, but it’ll have to be third-party stuff. 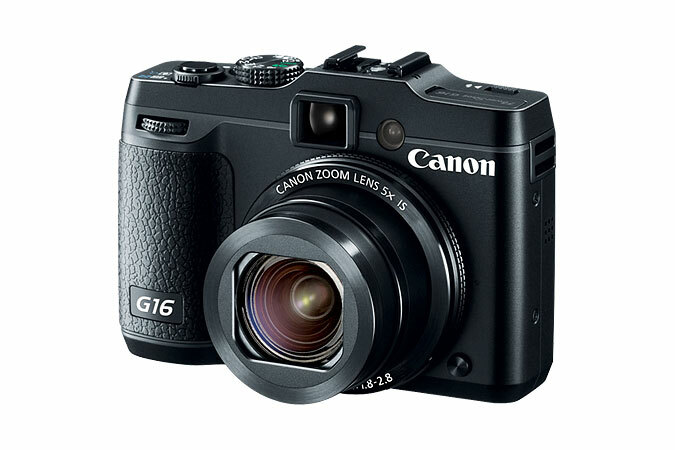 Priced at $549, you can order the Canon G16 now from Adorama, B&H Photo and most good camera shops. The CameraWindow app is free to download from Google Play and the Apple App Store. Visit the Canon web site for more information. Are you glad Canon has brought WiFi to their high-end compacts? Are you interested in this camera or is it too small an update from the G15? Leave your feedback in the comments below.